I really can’t believe how fast the D1 Grand Prix season has gone by this year. The new twin-round format certainly makes it seem that way, but at least every race weekend was jam-packed full of action for 2009. 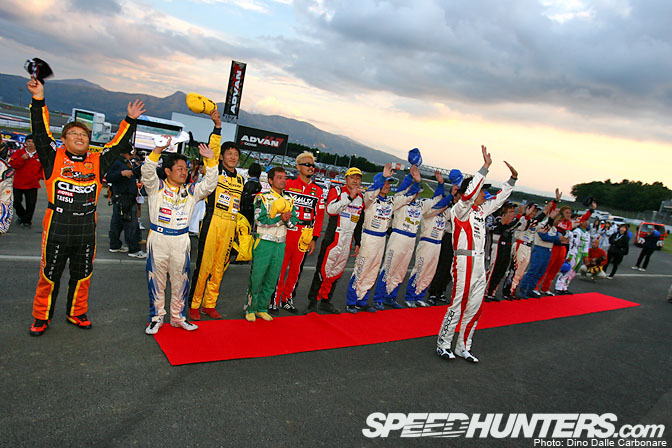 Round 8 ended with the drivers thanking the crowds for their continuous support, with Imamura, the new Champion, taking the lead in a big group bow. 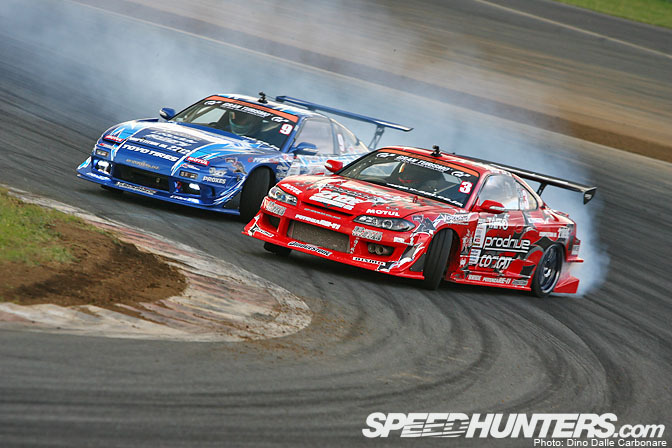 The drivers had provided the usual close racing during the Best 16, with plenty of close calls and tons of smoke like Inose with his Friends Racing S15 above. …but on his second repeat run he got on the power a little too early and a little to heavily as you can see from the massive trail of smoke. 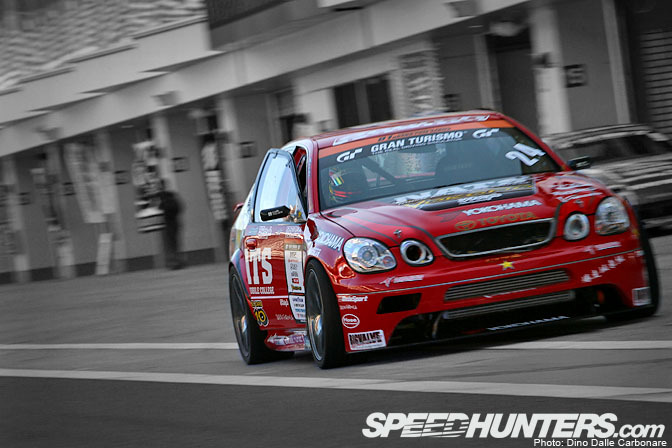 The car seemed to lose the angle at the apex and Imamura took the win, and the 2009 Championship. This was one I enjoyed watching, Kuroi vs. Suenaga in the Best 8. On his leading run Suenaga ended up going wide and Kuroi took full advantage of the space available, overtaking the RE Amemiya FD. Kuroi went on to meet Tokita in the Best 4. I was happy to see the Droo-P 3S-GTE powered UZZ40 Soarer was finally showing signs of improvement. Matsukawa didn’t make it into the Best 16 but put down some nice runs. Gotta love the whine of that X-trac sequential transmission it runs! Another non-qualifier for the Best 16 was Orido, who ended up 28th. However his Aristo seems to be better set up now than earlier in the year allowing him to do very well during the morning practice. He was unlucky in both of his qualifying rounds losing his angle and ending up in the dirt. I’m sure he will be more competitive next year. 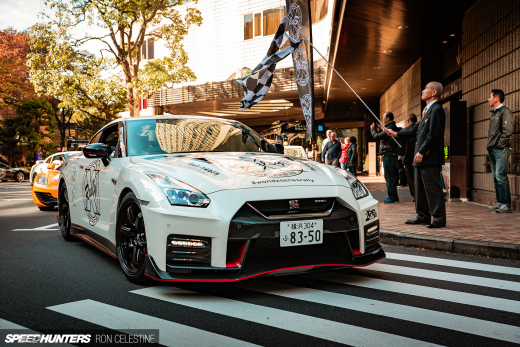 …looking especially mean from the front end. This G-Sonic Evolution kit works very well without the usual graphics we are used to seeing on D1 cars, but the cost just puts people off, about $15,000!! That’s considerably more than a second hand RSP13!! 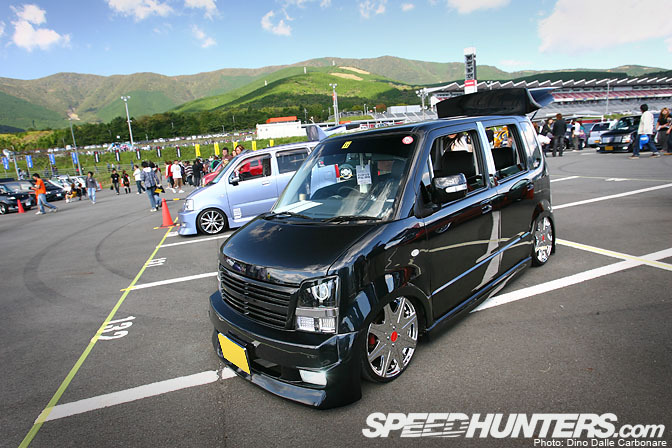 …as well as more VIP looking rides like this kei-van parked up on a separate area where a small custom show was set-up. There were tons of crazy vans like this scissor door equipped creation! I was happy to see Nakamura with his D-Max S15 battling it out in D1, and managing to qualify for the Best 16. He has shown he can handle the higher profile “GP” well, so it will be interesting to see if he will drop Street Legal for next year. Unfortunately he didn’t make it past Best 16, going out on his first battle against Matsui. 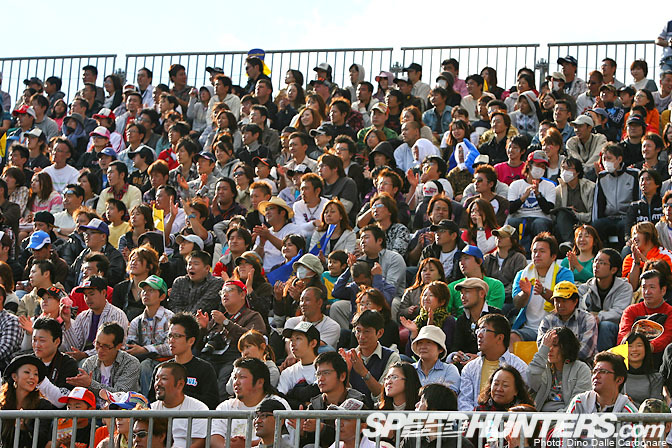 There were virtually no empty seats on the grandstands that had been put up for the event, and great to see such a good turn out for this final round of the season. 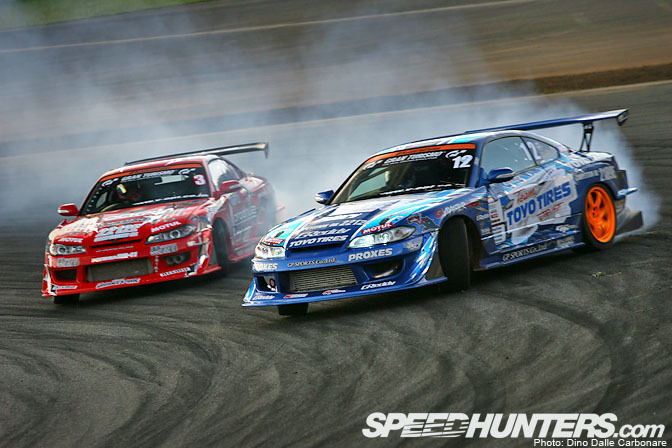 Imamura had no chance against Kawabata in the semi-final, the Team Toyo driver keeping incredibly close the S15. Yamashita also did a great job making it into the Best 16. 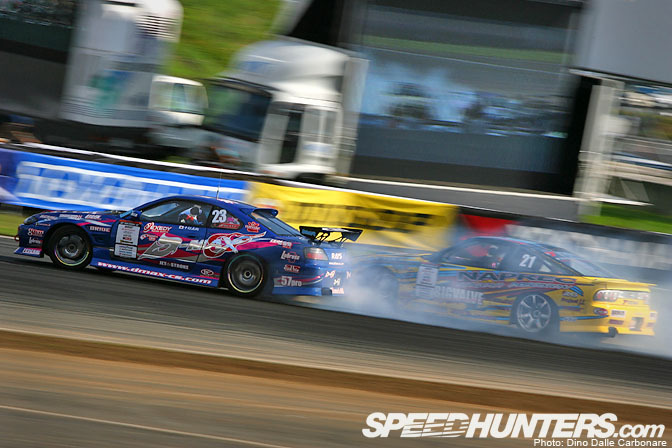 Here he is up against Kumakubo, barely visible behind the cloud of tire smoke! Kuma went through on this round but ended up getting beaten by Tokita in the Best 8. And the final, Kawabata in full form just like the day before for Round 7, leaving Kuroi blind in a cloud of smoke! 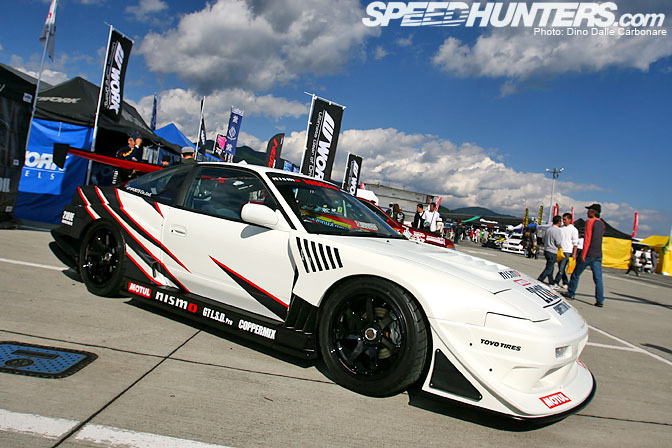 I’m really looking forward to 2010, seeing how this whole incredible drift movement will evolve. Will there be new cars? New drivers? And will we see talent further improve? We will have to wait until the spring to find out, but in the mean time we will make sure to bring you tons more drifting from D1-SL, MSC and lots of grassroots events. 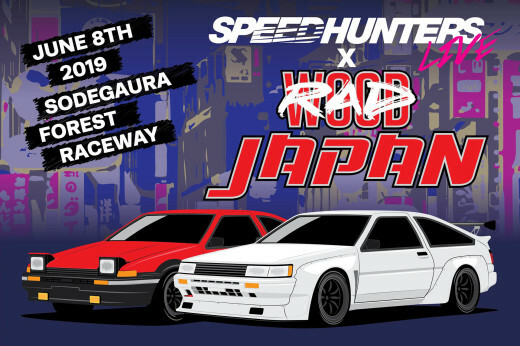 You know where to come for your drifting fix! As extreme, functional, and good-looking as the GP-Sports kits are, the price is just too ridiculous. You could probably mold/modify your own kits to the same wideness and aero functionality (bondo helps), and the price of the GP Sports kit doesn't even include the wing, I suppose? Idk, I like the kits, but they're too expensive. 15 grand? That's just absolutely absurd. 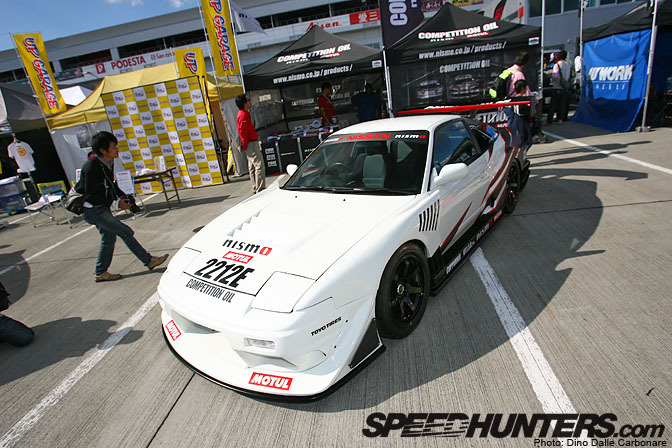 Tim, yes he sent his FD to Thailand and will be entering in the Formula D Thailand event held there next month. Can we get the imamura vs kawabata shot as a WP please~? No more option dvd's coming out to showcase this 09 D1 season?? Dino, how about a coverage of the Weld jxz110 chaser with this new livery! 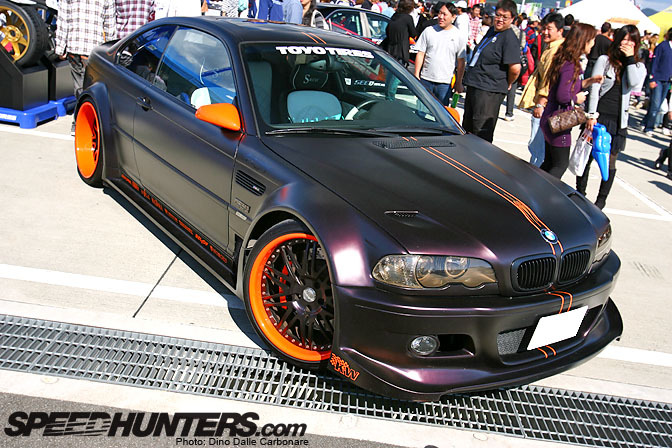 it's an awsome car! Weld JZX is not a Chaser and not a 110. Wallpaper please of the first shot of the GP Sports kitted RSP13?